In addition to chiropractic care, our office offers professional massage therapy services. We believe in the value that massage therapy adds to your chiropractic care and overall health. Massage services are performed by a licensed massage therapist who often coordinates your care with Dr. Giancola. A personal and professional consultation with the therapist will be conducted before your massage begins. You will then receive a complete massage session custom tailored to your specific goals. Our licensed massage therapist offers several different techniques specializing in Neuromuscular Massage and Trigger Point Therapy. These techniques are highly effective in treating many conditions such as; migraine and fibrocystic headaches, arthritis, TMJ, whiplash, tendinitis, carpal tunnel syndrome, and multiple sports injuries. With massage we can reduce swelling and inflammation to problem areas by helping to remove wastes and bring nutrition to injured cells. She also has training in pregnancy massage, heated stone massage, raindrop therapy, and paraffin wax treatments. During your consultation feel free to discuss these techniques and any other questions you may have about massage therapy and how it works. So we can better meet your needs and goals. We want to make your massage experience in our office as rewarding, relaxing, and enjoyable as we can make it. Having lived and experienced the benefits of chiropractic and a wellness lifestyle from a very young age, Julie chose a career that would allow her to help others experience the benefits of optimum health. She graduated from Canadian Therapeutic College in 1999 with an Associates Degree in Massage & Hydrotherapy. 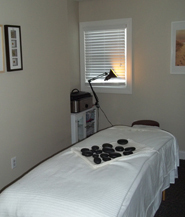 She has successfully completed national and state board exams and is a fully licensed massage therapist. Julie continues to participate in many continuing education forums to increase her knowledge of therapeutic services. In 2006 Julie earned her certificate as a Chiropractic Assistant from Life Chiropractic College and joined our team as Director of Therapeutic Services in January 2008. She also graduated from Laird Institute in 2009 and holds a license in Advanced Aesthetics. Julie is committed to providing a high quality of service and compassionate, individualized care to each practice member and client.